The title of this blog post is also the title of a presentation I will do at the 2019 Data Governance and Information Quality Conference in San Diego, US in June. There is a little difference between how we can exercise data governance and information quality management when we are handling data about products versus handling the most common data domain being party data (customer, vendor/supplier, employee and other roles). This topic was touched here on the blog in the post called Data Quality for the Product Domain vs the Party Domain. You can have a look at the full agenda for the DGIQ 2019 Conference here. 20 years ago, when I started working as a contractor and entrepreneur in the data management space, data was not on the top agenda at many enterprises. Fortunately, that has changed. An example is displayed by Schneider Electric CEO Jean-Pascal Tricoire in his recent blog post on how digitization and data can enable companies to be more sustainable. You can read it on the Schneider Electric Blog in the post 3 Myths About Sustainability and Business. Manufacturers in the building material sector naturally emphasizes on sustainability. In his post Jean-Pascal Tricoire says: “The digital revolution helps answering several of the major sustainability challenges, dispelling some of the lingering myths regarding sustainability and business growth”. One of three myths dispelled is: Sustainability data is still too costly and time-consuming to manage. 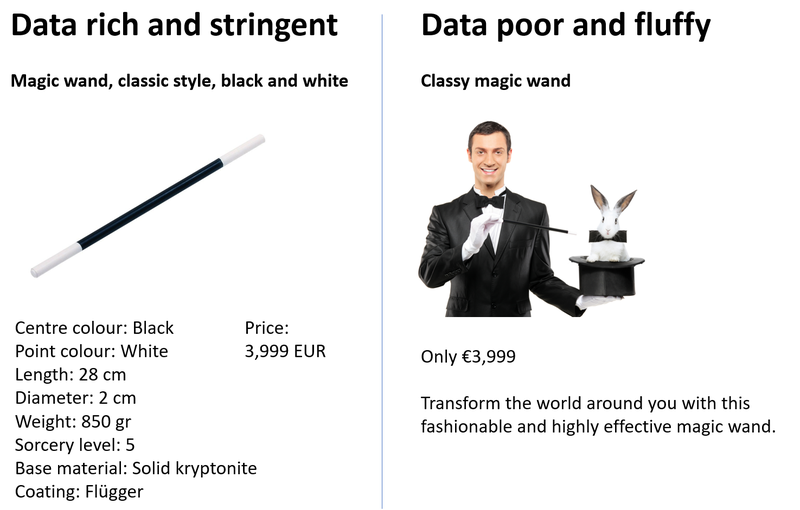 From my work with Master Data Management (MDM) and Product Information Management (PIM) at manufacturers and merchants in the building material sector I know that managing the basic product data, trading data and customer self-service ready product data is hard enough. Taking on sustainability data will only make that harder. So, we need to be smarter in our product data management. Smart and sustainable homes and smart sustainable cities need smart product data management. In his post Jean-Pascal Tricoire mentions that Schneider Electric has worked with other enterprises in their ecosystem in order to be smarter about product data related to sustainability. In my eyes the business ecosystem theme is key in the product data smartness quest as pondered in the post about How Manufacturers of Building Materials Can Improve Product Information Efficiency. This week I attended the Master Data Management Summit Europe 2018 and Data Governance Conference Europe 2018 in London. Among the recurring sessions year by year on this conference and the sister conferences around the world will be Aaron Zornes presenting the top MDM Vendors as he (that is the MDM Institute) sees it and the top System Integrators as well. Red circles: Is number 17 (in alphabetical order) Deloitte – in Denmark – who bought Platon 5 years ago or is it KPMG. Green arrow: Number 1 (in alphabetical order) Affecto has been bought by number 8 CGI during this year. PS: Recently I started a disruptive list of MDM vendors maintained by the vendors themselves. Perhaps the analysts can be helped by a similar list for System Integrators? As a Product Data Lake customer, you can be a subscriber to our public cloud (www.productdatalake.com) or install the Product Data Lake software on your private cloud. Now there is a hybrid option: Being a member of a subscriber cluster. A subscriber cluster is an option for example for an affiliated group of companies, where you can share product data internally while at the same time you can share product data with trading partners from outside your group using the same account. Already existing means to feed Product Data Lake include FTP file drops, traditional file upload from your desktop or network drives or actually entering data into Product Data Lake. Now you can also use our APIs for system to system data exchange. Get the full Product Data Lake Overview here (opens a PDF file). 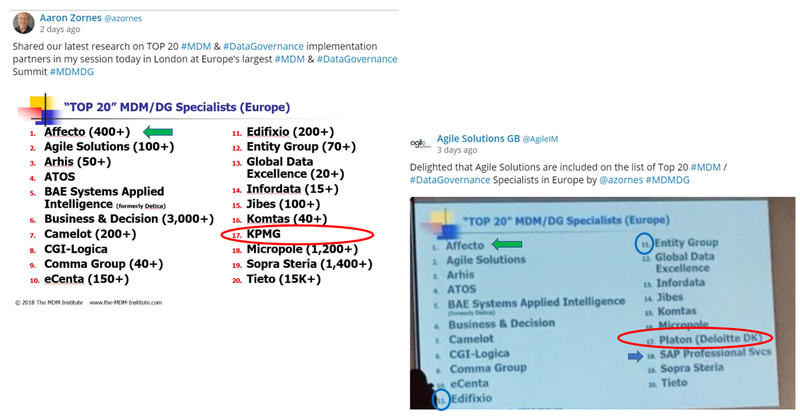 Back in 2015 Gartner, within a Magic Quadrant for MDM, described two different ways observed in how you may connect big data and master data management as reported in the post Two Ways of Exploiting Big Data with MDM. Capabilities to perform MDM functions directly against copies of big data sources such as social network data copied into a Hadoop environment. Gartner then found that there have been very few successful attempts (from a business value perspective) to implement this use case, mostly as a result of an inability to perform governance on the big datasets in question. Capabilities to link traditionally structured master data against those sources. Gartner then found that this use case is also sparse, but more common and more readily able to prove value. This use case is also gaining some traction with other types of unstructured data, such as content, audio and video. In my eyes the ability to perform governance on big datasets is key. In fact, master data will tend to be more externally generated and maintained, just like big data usually is. This will change our ways of doing information governance as for example discussed in the post MDM and SCM: Inside and outside the corporate walls. Eventually, we will see use cases of intersections of MDM and big data. The one I am working with right now is about how you can improve sharing of product master data (product information) between trading partners. While this quest may be used for analytical purposes, which is the said aim with big data, this service will fundamentally serve operational purposes, which is the predominant aim with master data management. This big data, or rather data lake, approach is about how we by linking metadata connects different perceptions of product information that exists in cross company supply chains. While everyone being on the same standard at the same time would be optimal, this is quite utopic. Therefore, we must encourage pushing product information (including rich textual content, audio and video) with the provider’s standard and do the “schema-on-read” stuff when each of the receivers pulls the product information for their purposes. If you want to learn more about how that goes, you can follow Product Data Lake here. Business outcome is the end goal of any data management activity may that be data governance, data quality management, Master Data Management (MDM) and Product Information Management (PIM). Business outcome comes from selling more and reducing costs.